Magnetic Labeling Tape creates movable magnetic labels that stick to anything made of steel. Great for labeling metal shelving or file cabinets. Easily cut to desired length with scissors and mark with permanent or water-soluble (dry-erase) marker so you can reuse the tape. 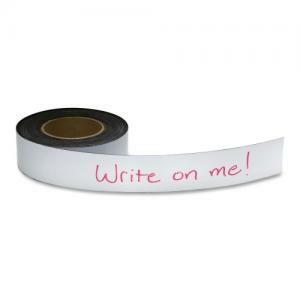 Labeling tape will not scratch surfaces. The magnetic surface is powerful but easily repositionable.